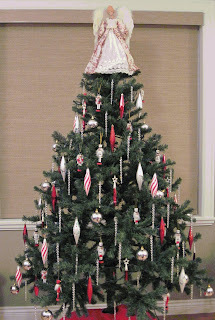 I usually post a photo of our Christmas Tree about this time of year. Usually it is an 8' Fraser Fir . . . but thanks to my medical woes I simply didn't come close to having the strength to deal with one this year. 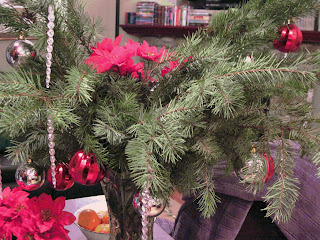 Instead we put up a 6' 15-year-old artificial tree that comes in three sections . . . (we usually have this on our outside porch facing the street . . . but we've had to forgo outside decorations this year). It isn't all that hard to set up, but with the chemo fatigue it took me a few hours . . . and my wife had to do most of the decorating. And, if you look closely you will see a number of nutcracker soldiers hanging on the tree. It's a lot smaller than our usual Fraser Fir . . . and doesn't fill the house with that wonderful "Christmas Tree" smell . . . but we like it anyway. As for the scent, we bought some Douglas Fir branches, which my darling lady wife arranged with ornaments so that we do get to smell the holidays after all. I hope that you and your loved ones enjoy the warmth and joy of this Holiday Season as we will. ... and here's to a much better year next year. And to you, Jeff. Merry Christmas and here's to 2013! It is not what the tree is made of but that the wishes, hopes, dreams and feelings of those who erected it, give it meaning. May you and yours have a blessed holiday and may you feel better and fully recover in the very near future. Yes, good idea about the boughs to bring in the scent! Merry Christmas, happy holidays and happy new year to you! Best wishes with your chemo therapy, too! Good looking tree and atmosphere. The tree looks splendid Jeff and a great idea with the branches too.